Here at Barkzilla, we're kind of old-school, which is why we love Moleskine notebooks. Designed to withstand the test of time and protect your stuff, we were thrilled to find out they've recently come out with a dog-themed journal. Designed to help record and keep track of all the moving parts in your pup's life from day one, the notebook has 5 themed sections including: Getting Ready (for those super organized who are in the process of finding their new canine companion), Personality, Dog Log, Traveling and Care. Though everything is "paper-less" and "digital" these days, we really prefer to have hard copies of important snapshots or Paddy-related documents. I mean, honestly-- is there anything most satisfying than flicking through a well organized notebook? We don't know if you can tell from the photo, but both covers actually have super cute doggy silhouettes embossed on them. And just like some of the other Moleskine passions notebooks we've seen, our doggie diary has some fun additions like a breed list and dog-to-human-year conversion chart (holy merde, Paddy is almost 28?!). You can also visit Moleskine's site to download additional templates to paste into your notebook. 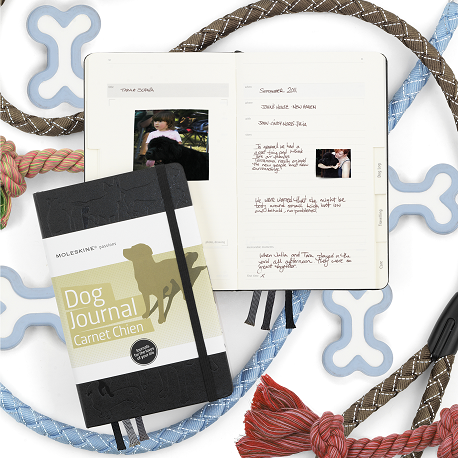 The sections we love most in our new doggy Moleskine? By far, the vaccination record chart and blank spaces for photographs and sketches. "I am so ready to tell my story! Put down that camera and start taking notes, lady!" We're really looking forward to filling ours out and will share it with you once we've started! All-in-all Moleskine's newest notebook makes it super easy to be organized and create a forever-record of all things pup related. Available from Amazon.com for a very reasonable $13.57. p.s. If you have a cat, there's also a feline version! Very cool! We received a Dog Journal for CHRISTMAS and have started filling it out. Perfect coffee table book. Just like a baby book. Watch for our post cos you're gonna want one for Paddy. I love this notebook from the cover all the way through! It's such good quality, has important stuff and great fun too! Hi Debby, Would love to see your journal!! You'll have to show it to us! 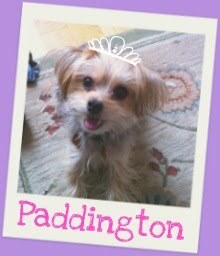 We started filling out Paddy's this week -- look for part 2 of our post soon!